Where has NAMEPA Been ? Where has NAMEPA been in November ? Marine pollution prevention, environmental education and collaborative stewardship development were on the minds of several dozen Tampa-area industry representatives as NAMEPA hosted its 2nd Maritime and Environmental Breakfast on Wednesday, November 19th. The breakfast was sponsored by Bajo, Cuva, Cohen and Turkel, an admiralty and maritime practice group based in Tampa, and the morning’s agenda offered attendees the opportunity to meet fellow maritime and environmental stakeholders and learn more about current maritime industry and marine environmental efforts throughout Florida. Local, state, and federal regulatory, business and conservation organizations were present, and attendees heard presentations from a diverse group of speakers. Tampa Bay Estuary Program Public Outreach Coordinator Nanette O’Hara offered a “State of the Bay” presentation, detailing the challenges and tremendous progress made by TBEP in what has been widely regarded as one of the nation’s most successful National Estuary Program efforts. LT Michael Persun of U.S. Coast Guard Sector St. Petersburg detailed the multi-missioned marine pollution-prevention, maritime security and marine safety work of the USCG. throughout the Tampa Bay area, and provided a valuable perspective on the unique regional issues managed by the St. Petersburg sector of the nation’s oldest and premier federal maritime agency. Air Director Jerry Campbell and Sustainability Coordinator Margaret Rush of the Environmental Protection Commission of Hillsborough County presented a Sustainability Report on Hillsborough County, focusing on the model of strong, multi-leveled partnerships and collaborative efforts coordinated by EPCHC with local and regional stakeholders. This offered attendees a unique insight into countywide efforts to promote sustainable growth within the Bay Area. NAMEPA sincerely thanks all of the participants, particularly our speakers, for a successful breakfast! All of the presentations will be available on NAMEPA’s website, and Save the Date for the next Maritime and Environmental Breakfast on January 13th! 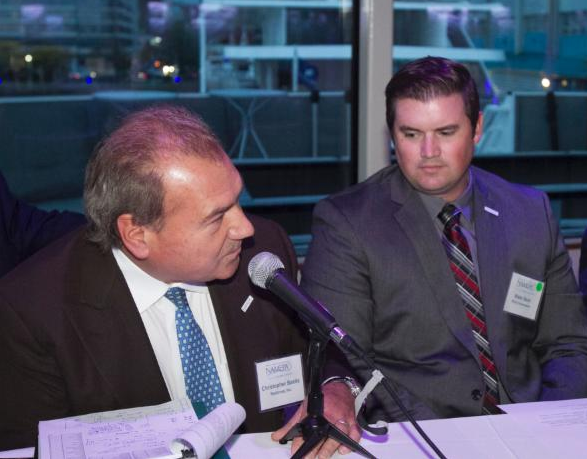 EIM Safety at Sea and National Maritime Day Celebration and AMVER Awards -Washington, D.C.
Lloyd’s Registry North America, Inc.
New York, NY – NAMEPA’s 2014 Annual Conference and Awards Dinner took place on October 29th on the M/S Hornblower at Pier 40 in New York. The maritime industry was once again well represented by shipping companies, USCG, government instances, suppliers, environmental NGO’s and Maritime Academies from the USA and Canada. Clay Maitland, the founding chairman, opened the conference with a warm welcome and set the tone for the day: The importance for every partner in the transportation chain to focus on risk management in relation to safety and environment protection. RADM Paul Thomas (USCG) kicked of the conference with a regulatory overview and then noted that 3 major factors influence the US shipping industry today: Domestic boom in the oil and gas industry; greening of the industry and growing complexity despite newer technology. All efforts should be focused on a tightly managed risk evaluation and prevention, as per the Admiral. The first panel of the morning, REVOLUTION, moderated by Kevin Krick (APL), started by Jonathan Waldron (Blake Rome LLP) of the regulations (USCG vs. EPA VGP) regrading discharge from vessels, the new ECA regulations and the Marine Casualty Reporting. Ian Workman (World Fuels Inc.) elaborated on the ECA and “the supply of low-low sulphur fuel”. On the1st of January 2015, the maximum sulphur level for use in an ECA will change from 1.00pct to 0.10pct by law, clarifying that there is NO grace period for the old 1.0% already on board! To comply there are 2 options available: LSGO or ULSFO which each their challenges; and alternatives: HFO with max 3.5% S and approved scrubber on board or the use of LNG, on which Langley Meek (GDF Suez Gas NA LLC) elaborated:” LNG has environmental benefits (no SOX, 85% less NOX) and is a saving compared to marine diesel.” Paul Topping (Transport Canada) ended this panel discussion informing us about the Canadian ECA and more specifically the issues faced in the Great Lakes : Alternative compliance in way of a flexible timeframe for domestic lakers as well as allowing the use HFO on cruise vessels while installing scrubbers. Transport Canada believes that in order to avoid violation, the penalties for non-compliance will have to be greater or equal than the savings for the use of non-compliant fuel. Health Canada, as a partner with Environment & Transport Canada, will continue to monitor the effect of the ECA (and other air-emission reduction initiatives) through health check statistics. Same is done in the US. The second panel discussion: “EVOLUTION: 25 years of Emergency Response Development”, was moderated by Bob Meyers (Robert J. Meyers and Associates, Inc.) who touched on the Preparedness & Planning aspect by outlining the various response plans, planning tools, trainings and tabletop exercises available. Ray Botto (SeaRiver Maritime Inc.) talked from a responsible party perspective on prevention. “Prevention should not be done out of fear, as prevention is an essential part of what we do.” The prevention model for safe marine transportation showed the various parties involved (vessel, management, crew, infrastructure and regulatory) and on what each of these parties should focus to make routine, incident free, transportation. The importance of a Unified Command was outlined by Capt. Gordon Loeble (USCG)’s presentation. Major changes came into place on an oil pollution prevention level with the adoption of OPA90. The public becomes also less tolerant every time a major oil spill occurs. Trust in and reputation of the maritime industry gets affected at every disaster. Response (clear roles and responsibilities for all parties) and Preparedness (contingency plans, remote sensing and continued exercises) is now part of the whole oil spill prevention program. The floor then went to the responders. Judith Roos (Marine Spill Response Corporation) explained that how we respond today is similar to how we responded when the biggest oil spill US history occurred in 1910, however today the work is facilitated by new technologies and better communication, the efficiency of response plans, tools, trainings, exercises, etc. Michael Popa (T&T Marine Salvage) showed us the extent of their investments to respond in case of oil spills and to live up to their role as salvage master in the Unified Command system. A clear description of the authority and responsibility of the Qualified Individual (QI) as member of the Spill Management Team (SMT) was given to us by Thomas J. Wiker (Gallagher Marine Systems LLC). During the well-attended lunch, Renee Marzon, president of The Marine Academy of Toledo, inspired us with her testimony of how she managed to attract youth to a maritime career. Her tuition-free school now has almost 300 youth registered and her enthusiasm managed to get the Toledo school board on “board” and is inspiring others to start similar projects. NAMEPA is a proud supporter of this amazing initiative. The afternoon kicked off with a panel discussion about the “Partners in the Marine Environment Protection”, with Chris Bastis (Sea Group Inc) as moderator. David Bolduc (Green Marine) gave us an overview of this voluntary certification program where the shipping industry (ship owners, ports, terminals, shipyards and The St. Lawrence Seaway) commits to reducing their environmental footprint above that required by regulations and also adhering to a total transparency policy. Paul Hankins excused himself but the American Salvage Association (ASA) was well represented by Doug Martin (Smit Salvage). “Partners in Defense” goal is to make sure salvers are the first on the scene. To achieve this the cooperation and coordination between the public, USCG, NOAA, and the shipping industry is essential. NAMEPA has been instrumental to bring all partners together. On the question “How do NGO’s and the private sector work together within viable economical boundaries?”, Johanna Polsenburg (Wildlife Conservancy Agency) replied with questions regarding PPP’s: How do we move forward, what are the roles of each partner, what do the NGO bring, how to get stakeholder engagement, role of government, increase enforcement, what entities should be in place? Clay Maitland, representing the Consortium for International Heritage, pointed out that heritage is not about the past, but about the future: trying to bring back the history of the merchant marine to bring awareness to the importance of the oceans in all aspects of life. This was a reminder of why NAMEPA is bringing us all together: the love of the maritime industry and the love of the oceans. “Evolution: Risk Management” with Alexandra Anagnostis (Total Marine Solutions) as moderator was the last panel of the day. Each senior leader present on the panel was asked a specific question, with the common thread: “How are organizations managing their risk operationally and in terms of reputational management?” The first was for Jeffrey Pribor (Jefferies LLC): Are you seeing an increase in the interests in environmental issues in the capital market? “Yes, but I don’t want to oversell this idea”. As per Jeffrey, environmental consciousness is driven by cost savings (ex. Eco-ships), not so much by a mitigation of risk. Wall Street knows about NOX/SOX because investors ask for it when considering investing. To Bud Darr (CLA): Is there increased awareness in the cruise line industry? “Yes”, he noted, ” there is a visible shift, driven by the risk of loss of reputation and CLA is committed to lead this change of mentality. ” To Paul Thomas: How prepared is the industry today? As he mentioned in the opening speech: ” The industry has to act pro-active instead of re-active in terms of management, but also in terms of regulations.” What is the best step we can take to mitigate the risk? -to which Chris Peterson (Titan Salvage) suggested to have salvage companies involved into the ship design and have more knowledge of their customers. Susan Dwarnick (BSEE): “What about the transparency of performance-based regulations. ” As per Susan, not everything can be regulated. The human element, often overseen, is addressed in performance-based regulations. As technology moves on, audits have to be more than a “check -the-box”. Every worker has to come to understand that every action he takes has consequences (i.e. personal ownership), but also understand the individual limits of decision taking. Bud added that when we create a safe environment for committees, truly important issues can be discussed amongst competitors and new best practices will come out. A Q&A closed this interesting panel. The conference ended with the Annual General Meeting and Awards Dinner. My name is Sara Garcia, 22, and am from Spring, Texas. I am a senior at the University of Texas at Austin studying Marine Science and Business Foundations and will graduate May 2015. I completed my research project during my Semester by the Sea experience at the UT Marine Science Institute in Port Aransas, Texas. Upon graduation, I hope to go to graduate school and focus on mitigating human impacts to the environment. My ultimate career goal is to own my own environmental consulting firm. Claire Hannapel is a North Carolina native. She is currently a junior at the University of North Carolina at Chapel Hill, majoring in Geological Sciences and enrolled in UNC-BEST, a fast-track teaching program. She is also heavily involved with the student organization, FLO Food, managing the semester Farmers’ Markets and working with the dining halls to improve their sustainable food purchasing. While Claire loves the Carolina community, she prefers being outside of the classroom, participating in hands-on, collaborative learning. In recent summers she has led trail-crews of high-school students in the Great Smoky Mountains and performed undergraduate research on coastal land loss in south Louisiana. Upon graduation, Claire intends to stay in NC, bringing this sort of excitement into the classroom and teach high school science. In her spare time, Claire enjoys cooking with friends and hiking on local trails with her dog. My name is Michael Bohnet, and I am a 15 year old sophomore from The Woodlands, Texas. I attend College Park High School where I will graduate in 2017. I earned the rank of Eagle Scout in the boy scouts, and I am an active member of our school’s wrestling team. My future plans are to graduate from college and become either a Mechanical or Petroleum engineer. My name is Andrew Hyung Joon Kang. I was born and raised on the island of Guam until the age of 17, thereafter I moved to Austin, TX to attend the University of Texas at Austin. I am currently majoring in Marine and Freshwater Science and plan to receive my degree in the spring semester of 2015. After my undergraduate education, I plan to take a year off and pursue some interests. I would like to work at a fisheries lab as a research assistant, become a commercial diver in the maritime industry, live aboard a commercial vessel and act as a marine endangered species observer, or move to another coastal fisheries state and work as a fish observer. In the future, I will attend graduate school and earn a Master’s degree in Marine and Freshwater Science. I am also interested in receiving my Doctorate. Hi, my name is Andy Kim and I am 15 years old. I live in The Woodlands, Texas and attend high school at the Academy of Science and Technology at College Park. I am in my freshman year and I will graduate high school in 2018. I absolutely love science and marvel at how medicine is developing. In the future, I hope to go to a medical school to delve into a specialized field of medicine, like ophthalmology or neurology. I am involved in Boy Scouts, where I am striving to become an Eagle Scout while enjoying my other hobbies (tennis and piano). Become a NAMEPA Member Today ! ADVOCATE, EDUCATE, ACTIVATEClick here to become a member today !